Louis de Buade, Comte de Frontenac et de Palluau (French pronunciation: ​[lwi də bɥad kɔ̃t də fʁɔ̃tənak e də palɥo]; May 22, 1622 – November 28, 1698) was a French soldier, courtier, and Governor General of New France from 1672 to 1682 and from 1689 to his death in 1698. He established a number of forts on the Great Lakes and engaged in a series of battles against the English and the Iroquois. In his first term, he supported the expansion of the fur trade, establishing Fort Frontenac (in what is now Kingston, Ontario) and came into conflict with the other members of the Sovereign Council over its expansion and over the corvées required to build the new forts. In particular, despite the opposition of bishop François de Laval, he supported selling brandy to the Aboriginal tribes, which Laval considered a mortal sin. The conflict with the Sovereign Council led to his recall in 1682. His second term was characterised by the defence of Quebec from a British invasion during King William's War, a successful guerrilla campaign against the Iroquois and English settlements which resulted in the elimination of the Iroquois threat against New France, and a large expansion of the fur trade using Canadian coureurs des bois. He died before his second recall to France. Frontenac was born in Saint-Germain-en-Laye, the son of Henri de Buade, colonel in the regiment of Navarre, and Anne Phélypeaux, daughter of Raymond Phélypeaux. The details of his early life are meager, as no trace of the Frontenac papers have been discovered. The de Buades, however, were a family of distinction in the principality of Bearn. Antoine de Buade, seigneur de Frontenac, grandfather of the future governor of New France, attained eminence as a councilor of state under Henri IV; and his children were brought up with the dauphin, afterwards Louis XIII. Frontenac entered the army at an early age. In 1635 he began his military career and he served under the prince of Orange in Holland, and fought with credit and received many wounds during engagements in the Low Countries and in Italy. He was promoted to the rank of colonel in the regiment of Normandy in 1643, and three years later, after distinguishing himself at the siege of Orbetello, where he had an arm broken, he was made maréchal de camp. Seventeenth century warfare ceased during the winter months and Frontenac, being a soldier, needed to keep occupied. Like many military officers, Frontenac took residence at the King’s court. Unfortunately for Frontenac, such a lavish lifestyle proved to be costly and his time at the King’s court only led him to amass more debt. His growing debt led him to seek an Arrêt du Conseil d’ État later in his life in order to protect his properties from his creditors who otherwise would have been able to seize his properties. Frontenac married Anne de La Grange-Trianon in October 1648. His service seems to have been continuous until the conclusion of the Peace of Westphalia in 1648, when he returned to his father's house in Paris and married, without the consent of her parents, Anne de la Grange-Trianon in October 1648. Frontenac courted her because she was set to inherit a large sum of money from her deceased mother and her father upon his death. Anne de la Grange-Trianon’s father had remarried and had a second child to ensure that his fortune would not go to his daughter and the son-in-law that he disapproved of. Therefore, when Frontenac's father-in-law died, Frontenac did not receive the money he was hoping for as his wife’s father left his fortune to his new wife. The marriage was not a happy one, and after the birth of a son incompatibility of temper led to a separation, the count retiring to his estate on the Indre, where by an extravagant course of living he became hopelessly involved in debt. Little is known of his career for the next fifteen years beyond the fact that he held a high position at court; but in the year 1669, when France sent a contingent to assist the Venetians in the defense of Crete against the Turks, Frontenac was placed in command of the troops on the recommendation of Turenne. In this expedition he won military glory; but his fortune was not improved thereby. In 1664, Frontenac admitted to owing debt of 325,878 livres plus 17,350 livres of interest to his creditors, which was not repaid by 1672 when his property was seized by creditors. Frontenac, however, was offered the position of governor-general of New France which deferred his debts until the end of his governorship. Frontenac was appointed governor and lieutenant general of New France, Acadia, the island of Newfoundland on April 7, 1672 and arrived in Quebec on the 7th of September that same year. A seventeenth-century painting of Anne de la Grange-Trianon can be seen today at the Chateau de Versailles. At this period the affairs of New France claimed the unexpected attention of the French court. From the year 1665 the colony had been successfully administered by three men: Daniel de Rémy de Courcelle, the governor, Jean Talon, the intendant, and the Marquis de Tracy, who had been appointed lieutenant general for the French king in America; but a difference of opinion had arisen between the governor and the intendant, and each had demanded the others recall in the public interest. At this crisis in the administration of New France, de Frontenac was appointed to succeed de Courcelle. From the beginning of Frontenac's term, it was evident that he was prepared to give effect to a policy of colonial expansion. He was also genuinely ambitious to inaugurate an era of prosperity for Canada. He exercised an independence of action that did not coincide with the views of his minister Colbert. As governor, Frontenac was undoubtedly the most powerful figure within the colony. Among his most prominent duties as governor, Frontenac maintained control over military matters and foreign affairs. Situated within the context of the French colony throughout the seventeenth century, foreign affairs largely encompassed the relations between French settlers and indigenous peoples. Although the governor was not allowed to intervene in matters handled by the Sovereign Council and the intendant, persons in these formal posts had to respect the governor as the ultimate voice of authority. Such compliance was based on the notion that the governor was the king’s representative. The governor was not merely an intermediary or a stand-in. The governor extended the king’s authority from France to the North American colony. As one of his first acts as governor, he established his presence as the sovereign delegate of the king by establishing in Canada the three estates – nobles, clergy and people – and convening a colonial Estates General to pledge fealty to him. The arrival of the governor implied that all of the colony’s settlers pledge their allegiance to the king. This was a duty that Frontenac did not take lightly. The royal policy, however, was adverse to the granting of extensive political rights to the Canadians, and Frontenac's reforms in this direction were disapproved. In relation to the hierarchy of authority within the colonial setting, any check on the governor’s power was altogether absent. In Frontenac’s case, France’s finance minister Jean-Baptiste Colbert, who resided an ocean away, could only impose restraints upon the governor’s powers. Thus, measures were adopted to curb his ambition by increasing the power of the Sovereign Council and by reviving the office of intendant. Responding to his reduction in the Sovereign Council to a figurehead, he expressed his infuriation by challenging the authority of the intendant, Jacques Duchesnau and demanding that the council refer to him as the "chief and president". Frontenac, however, was a man of dominant spirit, jealous of authority, prepared to exact obedience from all and to yield to none. In the course of events he soon became involved in quarrels with the intendant touching questions of precedence and with the ecclesiastics one or two of whom ventured to criticize his proceedings. The church in New France had been administered for many years by the religious orders; for the see of Quebec, so long contemplated, had not yet been erected. But three years after the arrival of Frontenac a former vicar apostolic, François-Xavier de Montmorency-Laval, returned to Quebec as bishop, with a jurisdiction over the whole of New France. In this redoubtable churchman, the governor found a vigorous opponent who was determined to render the state subordinate to the church. Frontenac, following in this respect in the footsteps of his predecessors, had issued trading licenses which permitted the sale of intoxicants. The bishop, supported by the intendant, endeavored to suppress this trade and sent an ambassador to France to obtain remedial action. The views of the bishop were upheld and henceforth authority was divided. Troubles ensued between the governor and the Sovereign Council, over its expansion and over the corvées required to build the new forts. In particular, despite the opposition of bishop François de Laval, he supported selling brandy to the First Nations, which Laval considered a mortal sin. The king and his minister had to listen to and adjudicate upon the appeals from the contending parties until one incident wore their patience out. After the adolescent son of Duchesneau was verbally abused on the street by a follower of Frontenac, Frontenac physically assaulted him with his cane when he deemed his explanation unacceptable and, after negotiation between himself, the intendant and the bishop, an officer of Frontenac detained and imprisoned Duchesneau’s son. Under the king’s edict of 1679, it was forbidden for a governor to arbitrarily imprison any subjects. Following a deliberation in Versailles, both governor and intendant were recalled to France in the year 1682. During Frontenac's first administration many improvements had been made in the country. The defenses had been strengthened, a fort was built at Cataraqui (now Kingston, Ontario), bearing the governor's name, and conditions of peace had been fairly maintained between the Iroquois on the one hand and the French and their allies, the Ottawas and the Hurons, on the other. Frontenac made his way to Cataraqui to build his post that would facilitate trading with the Iroquois Confederacy. Even though Frontenac was disobeying Colbert's policies, he was able to continuously act in such a way because he represented the King's person. Throughout his first term, Frontenac was engaging in the fur trade to increase his own fortune and those of his associates. According to La Salle, in his personal memoir, Frontenac was also trying to secure a monopoly over a large part of the fur trade. The progress of events during the next few years proved that the recall of the governor had been ill-timed. The Iroquois were assuming a threatening attitude towards the inhabitants, and Frontenac's successor, La Barre, was quite incapable of leading an army against such cunning foes. At the end of a year, La Barre was replaced by the marquis de Denonville, a man of ability and courage, who, though he showed some vigour in marching against the western Iroquois tribes, angered rather than intimidated them, and the massacre of Lachine on August 5, 1689 must be regarded as one of the unhappy results of his administrations. Reception for Frontenac's return to Quebec in October 1689. The affairs of the colony were now in a critical condition; a man of experience and decision was needed to cope with the difficulties, and Louis XIV, who was not wanting in sagacity, wisely made choice of the choleric count to represent and uphold the power of France. When, therefore, on October 17, 1689, Frontenac arrived in Quebec as governor for the second time, he received an enthusiastic welcome, and confidence was at once restored in the public mind. Quebec was not long to enjoy the blessing of peace. Frontenac’s return to New France during the Nine Years' War offered him an opportunity to display his military capabilities against England in North America. Despite the tensions created during his first term as governor-general, Frontenac was still unwilling to share power with the Sovereign Council and continued to profit from the Canadian fur trade. In January 1690, Frontenac approved the use of raiding parties composed of Canadians and Indigenous allies to ravage English border settlements. These parties raided the towns of Schenectady and Salmon Falls and indiscriminately murdered English settlers but spared the Iroquois. The raids were intended to deter the English from forming an alliance with the Iroquois, but instead united the English colonies against New France. On 16 October 1690, several New England ships under the command of Sir William Phips, governor of Massachusetts, appeared off the Island of Orleans, and an officer was sent ashore to demand the surrender of the fort. Frontenac, bold and fearless, responded with the famous words: "Non, je n'ai point de réponse à faire à votre général que par la bouche de mes canons et de mes fusils." ("I have no reply to make to your general other than from the mouths of my cannons and muskets."). Frontenac handled so vigorously the forces he had collected as to completely repulse the enemy, who in their hasty retreat left behind a few pieces of artillery on the Beauport shore. Frontenac receiving the envoy of William Phipps demanding the surrender of Quebec prior to the Battle of Quebec in 1690. The prestige of the governor was greatly increased by this event, and he was prepared to follow up his advantage by an attack on Boston from the sea, but his resources were inadequate for the undertaking. New France now rejoiced in a brief respite from her enemies, and during the interval Frontenac encouraged the revival of the drama at the Chateau St-Louis and paid some attention to the social life of the colony. New France had been under intermittent attack throughout the 17th century. The people however were not subdued and for two years after the Phips attack, a petty warfare was maintained. The sufferings of the colony, infested by war parties, were extreme. The fur trade, which formed its only resource for subsistence, was completely cut off, and a great accumulation of furs remained in the trading posts of the upper lakes, prevented from descending by the watchful enemy. To meet the threat, he dispatched Jean Baptiste Bissot, Sieur de Vincennes to establish a trading post and fort at Kekionga, present day Fort Wayne, Indiana. At a grand council of the friendly tribes, Frontenac took up a hatchet, brandished it in the air, and sang the war song, his officers following his example. 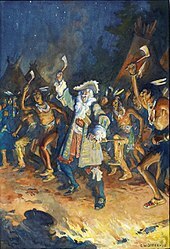 The Christian Indians of the neighboring missions rose and joined them, and so also did the Hurons and the Algonquins of Lake Nipissing, while Frontenac led the dance, whooping like the rest. His allies, roused to martial frenzy, promised war to the death, and several years of conflict followed. At length, after three years of destitution and misery, Frontenac broke the blockade of the Ottawa; the coveted treasure came safely to Montreal, and the colonists hailed him as their father and deliverer. Frontenac with indigenous allies, c. 1690. In 1696 Frontenac decided to take the field against the Iroquois, although at this time he was seventy-six years of age. On July 6 he left Lachine at the head of a considerable force for the village of the Onondagas, where he arrived a month later. In the meantime the Iroquois had abandoned their villages, and as pursuit was impracticable, the army commenced its return march on August 10. Frontenac endured the fatigue of the march as well as the youngest soldier, and for his courage and prowess he received the cross of St. Louis. Under Frontenac's leadership, the Canadian militia became increasingly adept at guerrilla warfare and took the war into Iroquois territory and attacked a number of English settlements. After waging a war of attrition between 1690 and 1698, the Iroquois fled the raided territory and negotiated for peace with the French. The result was that the threat of the Iroquois to New France was finally diffused. At the time of his second appointment as governor in 1689, France authorized the importation of slaves to Quebec from the West Indies. Frontenac died on November 28, 1698 at the Chateau St-Louis after a brief illness, deeply mourned by the Canadian people. The faults of the governor were those of temperament, which had been fostered by early environment. His nature was turbulent, and from his youth he had been used to command; but underlying a rough and hard exterior there was evidence of a kindly heart. He was fearless, resourceful and decisive, and triumphed as few men could have done over the difficulties and dangers of a most critical position. Quebec's most famous building and landmark, the Château Frontenac, is named after him, as is the Kingston Frontenacs ice hockey team. In Ontario, Frontenac Provincial Park near the site of the former Fort Frontenac and Fort Cataraqui (present day Kingston), is also named in his honour. In Québec, Frontenac National Park commemorates his governorship and leadership of Canada during challenging period of war with the British colonies. Statue of Frontenac at Quebec's Parliament Building in Quebec City (left), and a bust at Valiants Memorial in Ottawa. The provincial electoral district of Frontenac, Quebec. Frontenac, Missouri, a wealthy suburb of St. Louis. Frontenac, Minnesota, an old resort town on the Mississippi. The Frontenac rose, developed by Agriculture and Agri-Food Canada, was named in his honour. The Kingston Frontenacs team of the Ontario Hockey League were named in his honour. Frontenac Squadron at the Royal Military College of Canada was named so in his honour. Frontenac Axis: One of the very few outcroppings of the Canadian Shield to extend into the United States; situated at Kingston, Ontario and upper New York State. Frontenac's coat of arms marks the entrance to the Château, part of which lies on the site of his former home. Some have spotted him, dressed in 17th century garb, wandering the halls or floating through the ballroom. ^ Moogk, Peter N. (15 June 2015). "Louis de Buade, Comte de Frontenac". The Canadian Encyclopedia (online ed.). Historica Canada. ^ a b c d e f g h i j k l m n o p q r s t One or more of the preceding sentences incorporates text from a publication now in the public domain: Doughty, Arthur George (1911). "Frontenac et Palluau, Louis de Buade, Comte de" . In Chisholm, Hugh. Encyclopædia Britannica. 11 (11th ed.). Cambridge University Press. pp. 249–250. ^ Eccles, William John (1955). Frontenac and New France, 1672–1698 (PhD). Montreal, Quebec: McGill University. p. 34. ^ Eccles (1955), p. 39. ^ Eccles (1955), p. 42. ^ W. J. Eccles, Frontenac: The Courtier Governor (Toronto: McClelland and Stewart, 1959), 23. ^ a b Gilman, D. C.; Peck, H. T.; Colby, F. M., eds. (1905). "Frontenac, Louis de Buade" . New International Encyclopedia (1st ed.). New York: Dodd, Mead. ^ Quinn, A New World, 296. ^ Colby, Charles William (1915). The Fighting Governor: A Chronicle of Frontenac. New York: Glasgow, Brook & Company. pp. M1 p. 112. ^ Quinn, A New World, 277. ^ Ronald E. Gaffney. Battleground: Nova Scotia: The British, French, and First Nations at War in the North-East 1675–1760. ^ a b Parkman, Francis (1900). "Frontenac, Louis de Buade, Comte de" . In Wilson, J. G.; Fiske, J. Appletons' Cyclopædia of American Biography. New York: D. Appleton. ^ Quinn, A New World, 320-21. ^ Quinn, A New World, 325-26. Burke, Peter. The Fabrication of Louis XIV. New Haven: Yale University Press, 1992. Eccles, W. J. Frontenac: The Courtier Governor. Toronto: McClelland and Stewart, 1959. Eccles, W.J. Frontenac: The Courtier Governor. Lincoln: University of Nebraska Press, 2003. Eccles, William John. "Frontenac and New France, 1672–1698." PhD diss., McGill University, 1955. Quinn, Arthur. A New World: An Epic of Colonial America from the Founding of Jamestown to the Fall of Quebec. Boston: Faber & Faber, 1994. Eccles, W. J. (1979) . "Buade, Louis de, Comte de Frontenac et de Palluau". In Brown, George Williams. Dictionary of Canadian Biography. I (1000–1700) (online ed.). University of Toronto Press. Wikimedia Commons has media related to Frontenac. This page was last edited on 11 April 2019, at 13:03 (UTC).